This very detailed box was paited by a well-know established Fedoskino artist of Yuriy Butsinskiy. 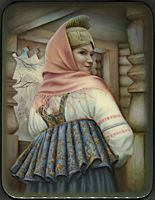 In the foreground Yuriy has painted the Russian boyarynya in traditional Russian costume of the 18-19th Centuries, while the background is showing us a part of the wooden building and some leafless bushes and trees. Smooth brown tones of oils are dominated here. Gold paint is used to highlight the ornaments on the rich looking cloth of young lady. The scene is outlined with gold line. The box's exterior is painted with black lacquer. The interior is traditionally red. The box is constructed from paper-mache. The lid is hinged from the left of the scene, and the box rests on a flat bottom. The work is signed with the artist's name, Fedoskino and the year of 2012.